Those of you who keep asking me about when will I conduct a Social Media Marketing workshop; here's a good news. Epitom Consulting is organizing a full day workshop on Social Media Marketing, and I will be the resource person for the event. Epitom is a reputed company organizing training workshops in Colombo, and I joined hands with them for adding a range of Social Media and eMarketing related topics for their public workshop calendar. 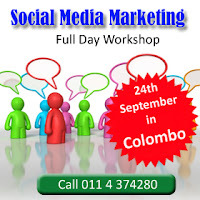 The workshop planned for 24th September, is an entry level 'boot camp' for Social Media newbies. Our effort is to get more Sri Lankan marketers involved in Social Media, and conduct more engaging evening sessions on more focused topics in the Social Media domain. Visit Epitom website for more details about the workshop or call them on 0114 37 4280 / 81 for registration inquiries. Wonderful post. I am searching awesome news and idea. What I have found from your site, it is actually highly content. You have spent long time for this post. It's a very useful and interesting site.